In this Post: Finding childcare doesn’t have to be a scary thing. Ask these 18 questions to determine if a provider is right for you and your families needs. Finding childcare for the first time is terrifying! To actually leave your babe and trust that someone will feed them properly, change their diapers correctly, and give them the same type of nurturing care you would is a lot to stomach! But at some point, if you do intend to go back to work, you will need to brave this feat! The nice thing with a job as a massage therapist is you can start out slow. Try one massage a day for a while to get your feet wet and make sure that the childcare you have selected is indeed a good fit. Though you do have the flexibility of easing in, it is still important to thoroughly vet your potential options and determine if they will be a good fit for you and your family prior to making a final commitment. 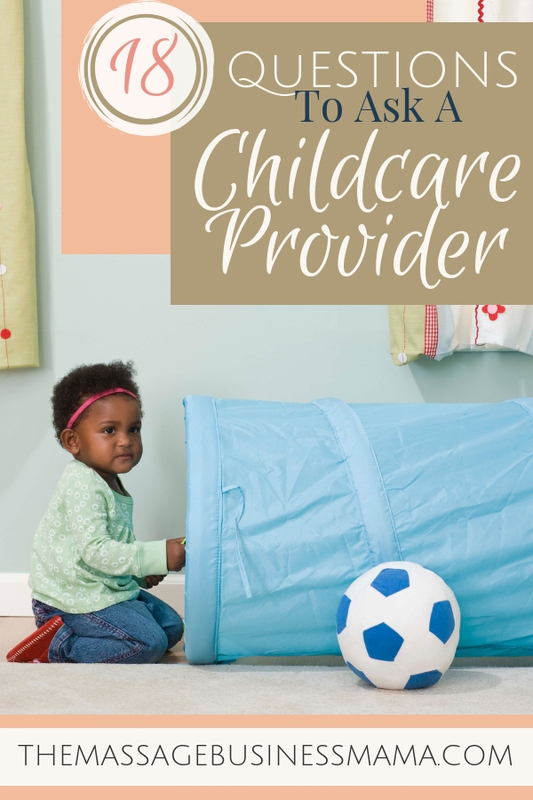 With so many different options for childcare, it is important to take a good, hard look at your needs. Are you going to be sporadic or consistent in the days and times you will need? Are you easing back into work, or are you hitting the ground running? Do you have multiple children? Do you have other needs, like housecleaning? This individualized care can be an amazing thing. Your child may be learning and exploring more than in other types of childcare environments, due to this specialized attention. Nannies will often do extras like dishes or laundry. Also if you have two or more children, it may be more cost effective to have a nanny. Maybe you love the idea of individualized care from a nanny but can’t afford it. A nanny-share could be the answer. An important thing to consider, whose family will provide the house or will you trade weekly? If the nanny comes to your house, you will have the bonus of having household extras included, but you will also be opening your house up to MUCH activity. However you decide to slice it up, make sure to be clear from the beginning. If you fail to come up with a plan regarding this divide, resentment could rear its nasty head! A daycare center can be a good option because of its consistency. You won’t have to worry about someone taking a sick day and having to scramble at the last minute. But germs are rampant in these type of environments, and you typically have to pay regardless of whether or not your child goes on any particular day. This can be a wonderful option for therapists who are only working a few hours, or ones who have an on-call schedule. The downside to this flexibility is cost. While it may make sense to pay a high hourly rate when you are only going in for 2 hours each day, it may not make as much sense if you will be working 4. Do the math. If your schedule is truly that varied and spur of the moment, this could work. Or if you are in a bind because your regular provider isn’t available, a drop-in center may save you! Family can be an amazing option for childcare if you are so blessed to have someone willing to help. Establish an open line of communication, make sure they are the type of family members with whom you can be completely honest with, (even if it is hard). If you have a tough relationship with your mother-in-law, she may not be the best choice to help! Figure out ahead of time if this is a permanent solution to your childcare needs, or if it is temporary. The more detailed you are in figuring out these specifics, the more smoothly things will go! In-home daycare centers offer the comfort of an environment similar to your child’s own home, while offering socialization. The bond between your child, their caregiver, and the other children who attend can run deep in this type of an environment! On the other hand, if the caregiver gets sick or has family drama, this can adversely affect your child, the care they receive, and reliability. In-home daycare is the option I chose for my childcare needs. I needed care starting at a young age, and many of the daycare centers wouldn’t accept my son until much later than my in-home provider was willing to do. At the time my schedule fluctuated quite drastically, so I didn’t want to pay for days my child was not attending, my in-home provider was willing to work with me here. When it comes down to it, you will have to go with your gut instinct. Trust yourself to know what the best situation is for your child. A reserved child may do better in a smaller environment, while a special needs child could thrive with a nanny! Take the time to visit a few providers and ask questions. Do you have to commit to certain days? If you have to commit to certain days, do you have to pay regardless of whether or not your child attends due to sickness, travel, or other reasons? How flexible is drop off and pick up time? And will you get dinged financially if you are a few minutes late? Are there pets or guns in the house? How many children does the provider take on at once? How close in age are the children to your child’s age? Do you have strong feelings about microwave use, and is your provider willing to work with you? Will the provider drive with your child in their car? What supplies does the provider need for your child? Is lunch provided? Do they need a car seat, snowsuit, or sunscreen? Is there more of an education or play focused theory to childcare? Do you have any strong religious or ideological beliefs? Is it important to you that your child is cared for by someone with similar beliefs? Will the tv be on? Will the provider help with potty training? Does the provider smoke, use drugs, or drink alcohol? How long have they provided care? And how long do they intend to continue providing care? Don’t be shy when asking questions. This is your beautiful, amazing child. It is your job to make sure the environment you are leaving them in is good, healthy, and meets the standards for which YOU feel appropriate. It also might be helpful to observe your child in a potential environment to see how they react to the various stimuli present. Your child learns how to play and share with other children their own age. My son spends hours running around with his buddy John daily. Do you think I could muster that same kind of enthusiasm for circling the kitchen? I think not! Because these providers spend long periods of time getting to know your child, your child has other adults they feel safe with that can be trusted. This type of connection is priceless, and helps the synapses in their brain grow and become stronger! Because you get the opportunity to be fulfilled from doing work you love, you will be a better, more grounded and present mom when you are with your child. If I wasn’t able to cross things off my to-do list, I would be a frazzled mess! And as you know, it is next to impossible to cross anything off a to-do list, much less make a to-do list when you have little ones around. Going back to work doesn’t have to be scary. Working Mom, realize that there are some huge benefits to sending your kiddo to childcare! Get over your mom guilt and feel proud that you are giving your child the opportunity to explore these benefits. 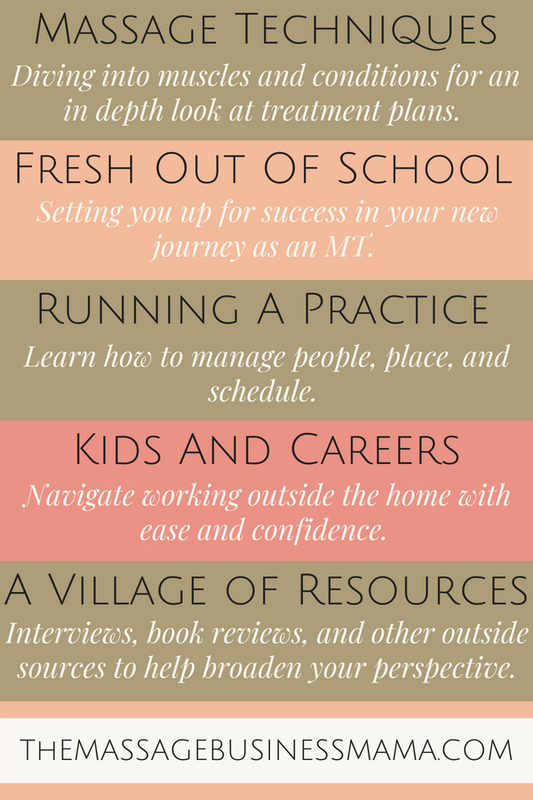 When you have taken the time to figure out a solution to your childcare needs that fits with your parenting style you can feel great about your decision to return to a career you love!